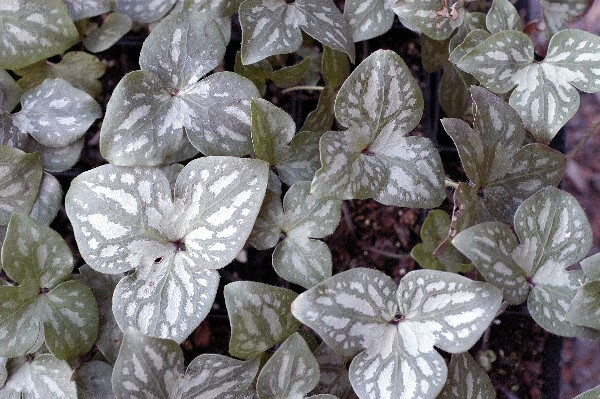 I've been breeding and selecting Hepatica acutiloba and Hepatica americana for the last eight years now, specifically for silvery marbled foliage. In the process, I've accumulated a very large stock of lovely, white flowered Hepatica acutiloba with medium green foliage that I'd like to share with you at a very special price that includes FREE SHIPPING. In the unlikely event that you're unfamiliar with the genus Hepatica, I'll tell you that Hepaticas are one of the most reliable, durable, desirable and perennial early Spring native wildflowers. They're exceptionally long flowering, long lived and very easy to grow. The genus Hepatica is a member of the Ranunculaceae family, the same family as Actaea, Cimicifuga, Helleborus and Thalictrum, et al. Culture is super easy as in nature they grow in woodland conditions, typically in rich, but well drained soil. In captivity, they thrive happily in the shade garden and love a bit of dappled sunlight, but don't mind deep shade at all. The foliage is persistent and attractive all the growing season long. The height is 3" - 6" tall and a mature clump can be up to 12" in diameter with more than 50 flowers. They're native to almost every state east of the Mississippi and their hardiness and heat tolerance is most likely zones 4 - 10. Division and seed are my preferred methods of propagation. By the way, the genus name, Hepatica, comes from the ancient Latin word, Hepaticus, which means liver, as the shape of the leaves resemble the human liver. In fact, in these mountains, the locals refer to Hepatica as "Liverleaf". I've been selling Hepatica acutiloba plants bareroot for $10.00 ea plus $9.00 for UPS. As a result of my breeding work, I've managed to accumulate a nice little stockpile of surplus plants and can now drastically reduce the price. The prices shown below include FREE SHIPPING on bareroot plants out of their 2" pots. If you would like to receive the plants undisturbed, in their pots, please add .95¢ per plant to cover the extra cost of shipping soil and pots. OH............If you'd like to see some of the results of my Hepatica breeding work, go to - http://sunfarm.com/images/hacutilobamarble1.jpg I hope to make these stunning plants available to the gardening public sometime in 2008.